Rhododendron L. genus (from greek rhodon = rose; dendron = tree) groups 800-1000 species of trees and shrubs, originary from the northern hemisphere, known as azaleas, rhododendrons or roses of the mountains. These species live in regions with bland winters and soft summers from China, Japan, India, North America and Europe. One of the best known species is Rhododendron indicum Sweet (azalea). 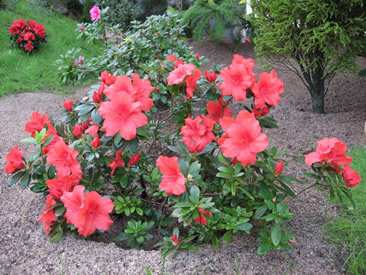 Azaleas are considered the most beautiful flowers of the winter. These plants attract both by the aspect, dimension and structure of the flower, which could be simple or involte and by strong colouring, in nuances which vary from red or violet to pink and unspotted white. The edge of the petals could be straight, waved or fringed. 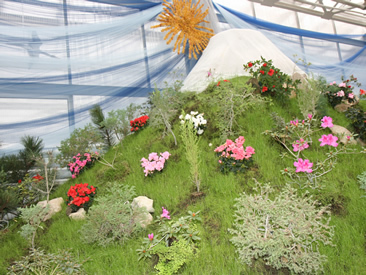 The collection of “Anastasie Fatu” Botanic Garden groups 35 cultivars which belong to Azalea indica species, showing a varied chromatic: dark red – 'Superba', 'Flacara', 'Ambrosiana', 'Europa', 'Cosmos' and 'Rolco', coral – 'Robert van Oost', carmin red – ‘Adventsglocke’, lilac – 'Kees Bier', 'Rubis' and 'Henny', violet – 'Madam A. Haerens', 'Concinnum' and 'Violaceea', pink – 'Doberburg', 'Vervaeneana', 'De wale’s favorite' and 'Eri Schäume', white – 'Petrick Alba' and 'Pax'. Camellia L. genus groups almost 120 species originary from tropical and subtropical regions of South-East Asia, China and Japan. Thin taxon was called in the honor of the botanist Georg Joseph KAMEL (Latin name Gregorius Josephus Camellus), who brought the plant from Philippines to Europe during the XVIIth century. 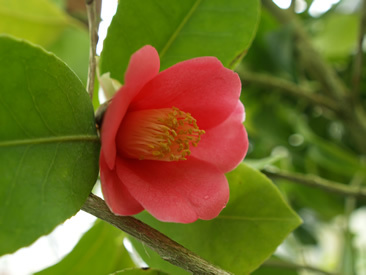 Camellias are cultivated especially in greenhouses, but also in gardens in the countries with bland winters: England, Belgium, Holland, France, Spain or Portugal. In Japan, camellias symbolize ambition and persistence, being a very appreciated decorative plant, known as Japanese rose, too. Camellias are very appreciated by the Chinese people, being painted on textures, fine porcelains or even on wood. Camellias are appreciated for the ornamental value of the shinny green persistent leaves, as well as for their big, simple or involte flowers. The flowers show various colours from white to red or violet, with all pink nuances. The edge of the petals could be straight, waved or fringed. Some camellia cultivars have the shape of the flower similar to that of the roses, peonies or pasque flowers. The collection of “Anastasie Fatu” Botanic Garden of Iasi groups 12 cultivars which belong to Camellia japonica L. species. They are in the public eye by the flowers’ shape and colour: red ('Chandleri Elegans', 'Alexander Hunter'), pink ('Elegans') or white ('Alba Simplex'). Fuji is a real symbol of Japan, become famous due to the classic symmetry of its form being considered mountain of all the seasons. Mount Fuji offers almost the same image, no matter the location of the onlooker could be. Its name has various significations: the incomparable, the unparalleled or warriors’ mountain, name used in Kamakura Shogunate times. According to Shinto religious tradition, all creatures of nature are animated by superior spirits, kami. This happens especially in Mount Fuji, which is the most venerated by the shintoists. According to Buddhist Japanese tradition, Mount Fuji appeared overnight during 268 b. Ch., when the Earth opened and formed Biwa Lake, the biggest Japanese lake, while the content of the abyss got up as a mountain. Fuji is officially venerated as a sacred mountain that is why, according to Goraiko tradition, men must climb it at least once in life for the joy of admiring the sunrise. It gives place to enunciate an incantation: ...be pure...stay sinless, oh, mountain, you! Mount Fuji has a special glamour in spring, when its top is covered by snow, while on its abrupt slopes and around the limpid lakes where it mirrors, azaleas, plums and cherries bloom. 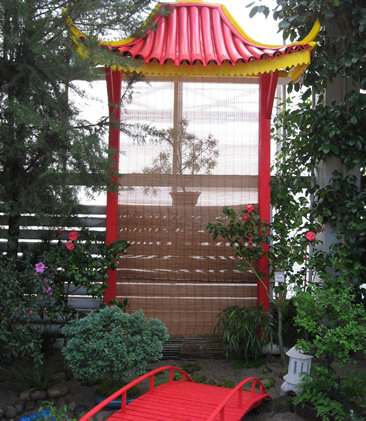 The Japanese gardens have always represented a challenging subject for landscape architecture lovers. The typical elements of those gardens: the water, sometimes suggested by the stones, the rocks, stone lanterns, coloured vaulted or zig-zag bridges, isles with symbolic shapes, simple or ornamented pagodas. The union of these symbols in the Japanese garden suggests the symbiosis between nature and art. The pagodas, these precincts designed for meditation and self recovering, are noticed by every passerby. The presence of the water suggests the irreversible time passage, while the vaulted bridge is a symbol associated with the passage from a world to another, element which is found in the entire Japanese art. The rocks have a noble savagery, suggesting steadiness and the big passage. Cat footsteps are associated with the philosophic alley which separates, step by step, the nature lover by the agitated and fatiguing world where he came from. The stones are irregularly disposed and the places where they change direction represent attraction points which advice him to stop, suggesting at other level, the meditative moments in life. The lanterns are also made by stone; their mysterious presence accommodates fires lighted by the Christians or give light to the nocturne ceremonies for tea. The plants occupy a secondary place in the Japanese gardens. Nevertheless, the pine and the bamboo are always present. The pine suggests the power of the character, while the bamboo, friendship and fidelity. In a Japanese garden bonsai art cannot be absent, which is focused on modeling plants in an harmonious style, closed to the nature reality. In the equatorial forests from Africa, South America and Asia live plant species that, in order to obtain the light which goes through the treetops, adapted to living in the height, known as epiphytes. They are braced on the thick branches of the trees, where a thin land coat appears, resulted from the decomposition of vegetal residues. The best known epiphytes are the orchids, due to the flowers diversity with unbelievable shapes and colours. These plants have always paid for our attention, being considered symbols of love and beauty. 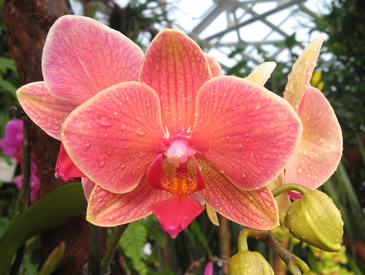 Orchids are spread all over the continents, from the fields to heights of 2000 m even 4000 m.
Known from the antiquity, the orchids are mentioned in Confucius’s writings (551–479 b. Ch.) as plants used to decorate indoors. He often associates orchids with “the pleasure of encountering a good friend after a long absence, which could be compared only with the joy we feel when we enter a room full of orchids”. In its scientific writings, Theophrast (370–285 b. Ch.) gives the name orchis to a few species which had tubers in the soil. First tropical orchids have been brought to Europe by the explorers, merchandisers and evangelical missionaries in the XVIth century. Chinese people associate the orchids with spring festivals. These plants, with royal fragrance, are used to carry off the negative touches. The collection of “Anastasie Fatu” Botanic Garden of Iasi groups more than 60 species and hybrids: Cattleya labiata, Lycaste aromatica, L. deppei, Stanhopea insignis, S. hernandezii, Vanda tricolor, which prefer tree support, while species belonging to Oncidium, Paphiopedilum, Cymbidium, Phalaenopsis genus etc. develop on the land. Representatives of Bromeliaceae family (Aechmea, Ananas, Billbergia, Nidularium, Vriesea, Cryptanthus) and of Guzmania genus attract by their leaves consistency and aspect, but especially by the unusual shapes and colours of the flowers. 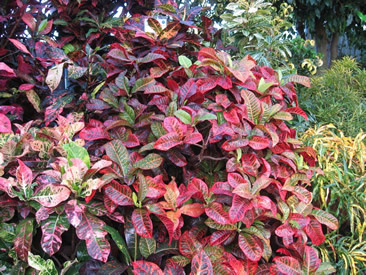 Codiaeum genus groups croton species and cultivars (Joseph’s coat), which impress by their leaves design, form, texture, volume and chromatic: especially by their green nuances with yellow, orange, pink or red veins. These plants are originary from Malaysia and belong to Euphorbiaceae family. The plant could be of 70-80 cm high, with shrub aspect. The leaves are persistent, with simple or divided edges, long, wide or narrowed, alternatively disposed. The flowers do not have decorative value that is why they have to be eliminated not to deplete the plant. The collection of the Botanic Garden groups 25 cultivars which belong to Codiaeum variegatum var. pictum taxa: ‘Goldfinger’, ‘Goldstar’, ‘Mrs. Iceton’, ‘Norma’, ‘Petra’, ‘Pictum’ etc.